WinTar is a simple and cute 32-bit Windows version tarball archiver - a powerful tool which allows you to create, manage and extract most popular Unix/Linux tarball and windows format archive files. 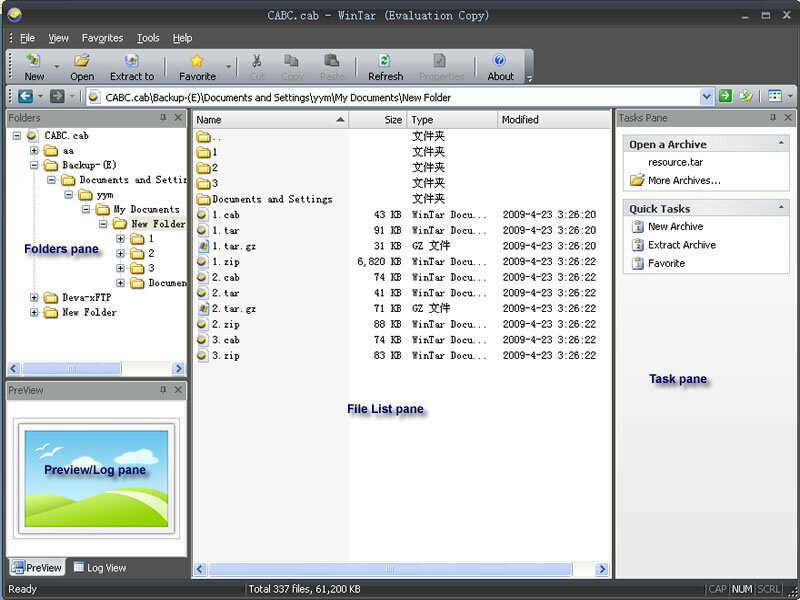 WinTar can create and read several different archive formats, including most popular tar variants, several cpio formats, and both BSD and GNU ar variants. It can also write shar archives and read ISO9660 CDROM images, Windows CAB and ZIP archives. WinTar can read and extract GNU tar, ustar, pax interchange format, cpio,Mtree, Zip, CAB and ISO9660 formats. WinTar can create ustar, pax interchange format, cpio, shar formats, Mtree, CAB and Zip archive formats. WinTar can read and write POSIX formats: POSIX-standard formats, including ustar, pax interchange format, and the POSIX cpio formats. WinTar supports pax interchange format: Pax interchange format is really an extended tar format. WinTar eliminates almost all limitations of historic tar formats and provides a standard method for incorporating vendor-specific extensions. WinTar supports of Gzip, Bzip2, UnixCompress highly sophisticated compression algorithms and None compression method. WinTar supports creating and extracting Zip and Windows CAB archive formats, compressed or non-compressed. When reading archive files, WinTar can automatically detect archive formats and its compression method. When viewing a archive file, if there are image files in the archive, WinTar can Thumbnail and priview these image files in File List pane window and the Preview pane window. When create archive or extract files from archive, WinTar can log the operations in the Log pane window. The Quich Tasks pane lists some often used commands, users can quickly perform some main commands on it. Automatically detect archive formats and its compression method.